A sample of pictures from the Taylor family, and happy times at Mornington Crescent. I live in one of the houses on Mornington Crescent now. I wonder if the picture shown above is of the house i’m occupying now – would be nice to know the history of this place. Hi Colin Xmas greatings , Yes loads of fun for a young lad. We lived at number 21 in 1954. I was born in Changi hospital but was only a few weeks old when we left to go back to England. (Well not “back” for me as I had never been in England)! My eldest brother was 7 and the next one down was 4 so they remember a bit about it. There was a big Magnolia tree outside the bedroom window apparenrly which Brian would climb down. I am visiting Singapore next March (2018) so I will probably take a trip to Seletar and Mornington Crescent. Did you enjoy your visit? I would love to go and see the place. We went on the way back from Australia where my family now live so they holidayed with us and they then went on to Kuala Lumpa to visit Legoland. We had a lovely trip Wendy thank you. We went to Marina Bay Sands Hotel which was fabulous and ‘Gardens by the Bay’ which was unbelievable. I was very pleased that all the houses on Mornington Crescent were still in good order. I think it’s hilarious that all the roads have such English sounding names, like Lambeth Walk etc.😁. Singapore is so crazy, I didn’t realise how built-up it was, I’ve never seen anything like it. We used the bus a lot and drove for miles and miles and it still looked like we were still in the same place !! We had a fun time and my brother appreciated the photos. Sounds great, one day soon I may make it too. I used to live at No.12 Mornington Crescent. I believe it’s the same building as the one the Taylors used to occupy. This would be the unit facing the former DCA building. I lived there for about 15 years as my dad used to work in one of the Aviation companies in Seletar (Singas which later became Dowty Aerospace before they moved to loyang). @Hi Darren, i think we grew up together if i racall right. Do you have an older sister from Serangoon Secondary? I forgot her name. I lived at 14 Mornington with my 2 younger brothers Nesan and Ramesh. @ Nisa, great chilhood memories for all of us in the airbase.I lived there from 1978-87′. Have been back for visits and it’s so sad that the whole west camp is gone.I pass by my old pass every time i’m in Singapore. HI we lived at far end 21 1961-63 time the crescent was a green field and a clear view to the school across the main road my climing tree was cut down to build about late 1962. Clive Breakwell N Wales UK. We lived at 21 in 1954. Just saw the houses last week and took photos for my brother to see. The houses are still in very good nick. Thanks Susan its nice to know. I am still at No. 8. Our current lease ends this year, but we hope to stay for much longer. Goodness, we lived at 8 Mornington Crescent back in early 1959 through to December 1961. I would so like to see it now. I have a photo taken about 20 years ago. We had a banana bush in the garden and my mother planted pineapples. Hi Wendy, my family and I are still at no. 8. We’ve been here since 2009. No banana bush in the garden when we moved in but we do have a durian tree and a mango tree. Thank you for your reply Nisa, I would love to see it now. I recall a long bedroom with two huge ceiling fans at the front. There was a small building in the garden for the Amah and chit chats on the walls. I lived at no. 8 in 1950. My farther was an RAF WO. 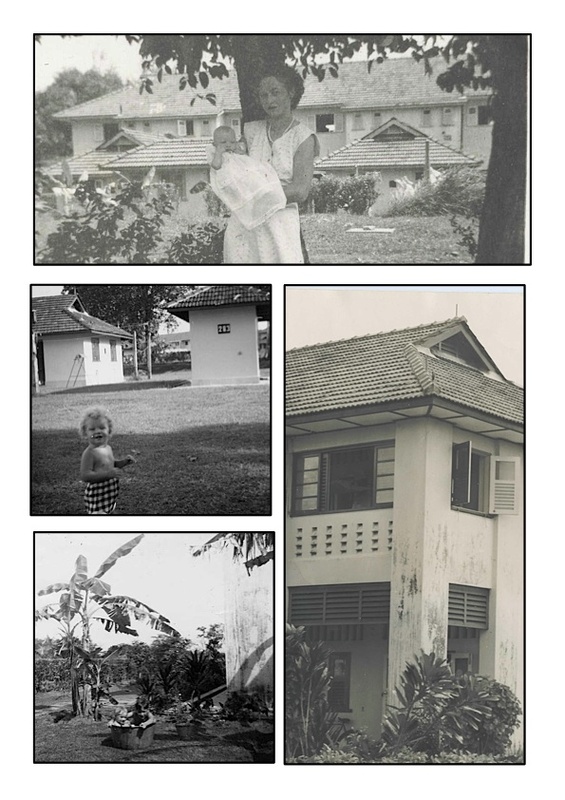 The recently published book ‘Uncovering Seletar’ has, on page 91, a photo of a block of Mornington Crescent houses which may well be no. 8 at the end. Very happy memories of those times in Singapore. My wife Lisa and I lived at #10 between 2003 and 2005. It was our happiest home while we lived in Singapore. It’s sad to see the area now, as the houses have been “let go” somewhat. Hi Leon, there are a number of houses currently being refurbished in Morning Crescent as it’s been vacated by the previous tenants. I’ll be sad when it’s time for us to go, because as you said, it’s our happiest home too. Are you still living on Mornington Crescent? It is such a beautiful and charming place. I drove past lately and is now considering leasing. Would love to hear from a current resident on how it is like and if the deserted building across the street poses any issue? Yes, I am still here. We are finding it so hard to leave! As a matter of fact, I’ll be gaining a new neighbour as someone will be soon moving into the empty home next door.